Based on the Life of Sgt. David Hack, The Life of a Warrior details a life started in the backwater of Sun Fish, Kentucky through tragedy, war, success and even Irish Knighthood. 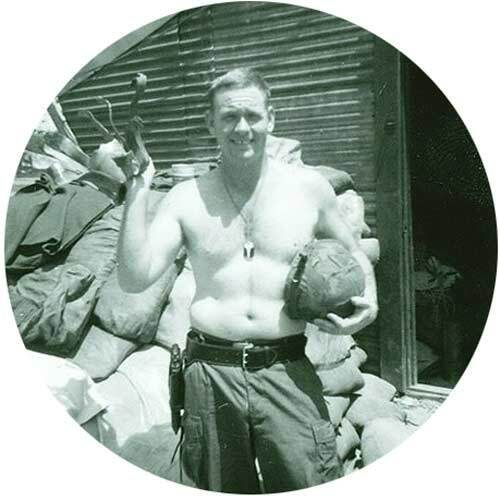 The book touches on fascinating aspects of Sarge's life, from his impoverished childhood, his military service, being the US Army's top recruiter, the lows of life after the military, his business and personal successes and his Royal Irish background. The Life Of A Warrior is the story of a man who rose from a dirt-floor shack to rub elbows with Presidents. David Hack's life, sacrifices and accomplishments in the face of extreme adversity are examples of the spirit of anyone who has feared, doubted, suffered and even failed, but refused to quit. The Life Of A Warrior's positive message has helped & inspired countless people. Sarge has overcome many challenges in his life, including an impoverished childhood, an abusive father, life-threatening wounds received during his stint in Vietnam for which he received a second purple heart, homelessness, and most recently an unjustified and relentless smear campaign which dwells on past statements that have been corrected by Sgt Hack. These attacks are carried out by haters who are on a cyberstalking witch-hunt. Although he still carries both physical and emotional scars from these challenges, Sarge has transcended these painful events and used them as a catalyst to motivate himself to achieve his successes - from being the Nation's #1 US Army recruiter for four years running to heading a retail business, which has survived despite the unjustified smears, and which supplies both the US Military and the general public. Sarge's faith, hard work and can-do attitude have taken him from a child who lived in a dirt-floor shack in Sunfish KY to a man who counts among his closest supporters senior military officers and others. As a person who knows a thing or two about physical and emotional scars, Sarge is quick to help and encourage those who are facing similar challenges. Sarge's book, The Life Of A Warrior, was written with this goal in mind. Its positive message of triumph over adversity has helped countless people, including many military veterans, all around the world. 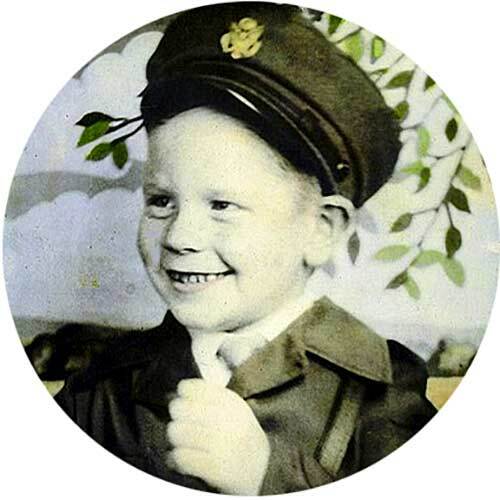 When I was 4 years old the Army used that picture to sell WAR Bonds worldwide when I turned 5 my Father took me and my Mother and my three Brothers to Sunfish KY and left us at a door step of a friend to defend for ourself.. I never looked back. 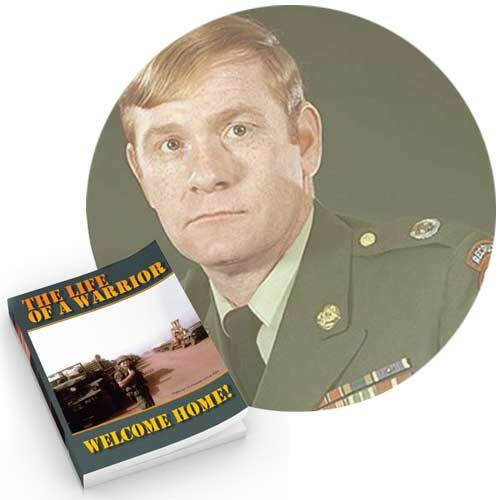 "Your book gives hope about my future"
The book is a great look on one man's life as a soldier in Vietnam. Good times and hard times. As he saw his friends fight and die, along with his self being all shot up. The one time Sgt. Hack was hit was on Rocket Day, April 10th 1968. I saw the rocket that hit Hack. Since then our lives have come around 360 degrees, as we finally got to meet 45 years later. ?A great meeting. So this is why I enjoyed the book, I knew what he went through and never gave up. A true friend and survivor he was. I would fight anywhere, anytime with my friend, Sgt. David Hack. ?War is so hard to forget and so easy to remember. 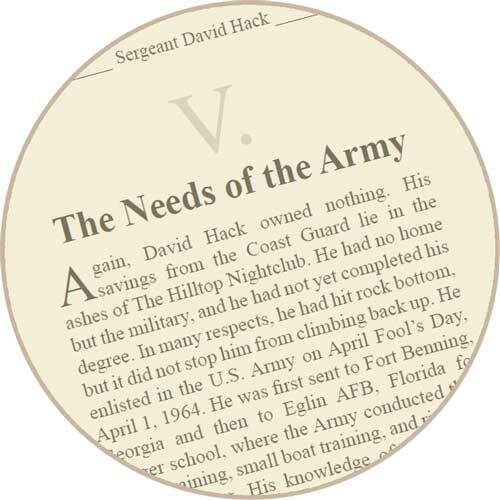 SFC Hack, I read your book over the weekend and enjoyed it. I found it floating around the VVA office here at Moberly Correctional Center. Your book gives hope about my future. I feel down a lot and grasp at information to help me along. I am 43 years old, an Army medic, and did a tour of Iraq 2007 to 2008. I came home and began having all kinds of problems. I was dealing with hyper vigilance, nightmares, paranoia, and depression. I got into a fight that turned deadly and came to prison on a manslaughter charge. I, too, just wanted to go away and disappear when I cam home. I lost several guys from my FOB, I can't imagine losing a whole company. I was a medic for convoy security driving throughout Iraq while dodging IEDs. I am an associate member in the VVA chapter here. I do a lot of the secretarial work. I like it because it keeps me connected to other veterans here at the prison. I hope to get involved with other veterans organizations when I get out. Your story give me hope about returning to society and being successful. I was a firefighter/paramedic and can't return to my profession because of my felony. But I will continue to strive to be my best. You also give me hope to find love again. I was married but that has gone away with my conviction. I do hope to remarry one day. I did not serve with SFC Hack in Vietnam. I did serve with him in the Cleveland, OH Recruiting Main Station when I was a Unit of Choice Recruiter for the 101st Airborne Division. He was, without question, the most dynamic, personable, motivated Army Recruiter I have ever had the pleasure of serving with. He singlehandedly was responsible for the entry onto active duty to the 101st Abn Div more recruits than the rest of the RMS combined. We worked together to set up parachute demonstrations, Helicopter Rappelling demonstrations and for the lack of a better term - meet and greets with all of the high schools in the area. He taught me more about how to motivate people than all the other schools, classes, people in my life. I purchased my first jacket - an A-2 in 1994. I was pleased to find the owner of the company, US Wings was none other than my old friend SFC David Hack. 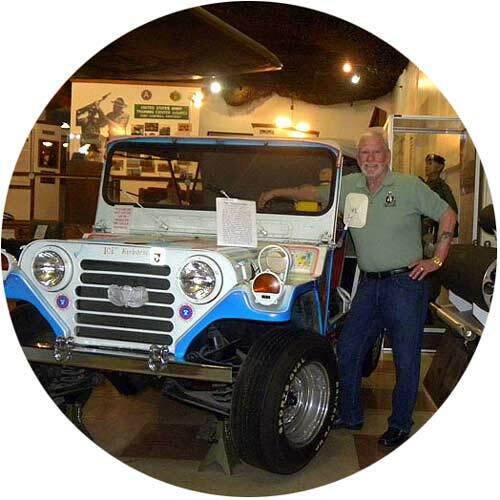 I knew he had retired from the Army and was a Chief of Police in the town they lived in, I had no idea that he and Lani had started one of the very first internet sales companies on the planet. I consider David one of my oldest friends. We can go several years with no contact and start again without missing a beat. Good book, that accurately portrays what we went through in the RVN. Thank you David for finally writing the book! !